This pioneering research focuses on Biomimetic Interactive Architecture using “Computation”, “Embodiment”, and “Biology” to generate an intimate embodied convergence to propose a novel rule-based design framework for creating organic architectures composed of swarm-based intelligent components. Furthermore, the research boldly claims that Interactive Architecture should emerge as the next truly Organic Architecture. As the world and society are dynamically changing, especially in this digital era, the research dares to challenge the Utilitas, Firmitas, and Venustas of the traditional architectural Weltanschauung, and rejects them by adopting the novel notion that architecture should be dynamic, fluid, and interactive. This project reflects a trajectory from the 1960’s with the advent of the avant-garde architectural design group, Archigram, and its numerous intriguing and pioneering visionary projects. Archigram’s non-standard, mobile, and interactive projects profoundly influenced a new generation of architects to explore the connection between technology and their architectural projects. This research continues this trend of exploring novel design thinking and the framework of Interactive Architecture by discovering the interrelationship amongst three major topics: “Computation”, “Embodiment”, and “Biology”. The project aims to elucidate pioneering research combining these three topics in one discourse: “Bio-inspired digital architectural design”. These three major topics will be introduced in this Summary. “Computation”, is any type of calculation that includes both arithmetical and nonarithmetical steps and follows a well-defined model understood and described as, for example, an algorithm. But, in this research, refers to the use of data storage, parametric design application, and physical computing for developing informed architectural designs. “Form” has always been the most critical focus in architectural design, and this focus has also been a major driver behind the application computational design in Architecture. Nonetheless, this research will interpret the term “Form” in architecture as a continual “information processor” rather than the result of information processing. In other words, “Form” should not be perceived only as an expressive appearance based computational outcome but rather as a real-time process of information processing, akin to organic “Formation”. Architecture embodying kinetic ability for adjusting or changing its shape with the ability to process the surroundings and feedback in accordance with its free will with an inherent interactive intelligent movement of a living body. Additionally, it is also crucial to address the question of whether computational technologies are being properly harnessed, if they are only used for form-generating purposes in architecture design, or should this be replaced with real-time information communication and control systems to produce interactive architectures, with embodied computation abilities? “Embodiment” in the context of this research is embedded in Umberto Eco’s vision on Semiotics, theories underlying media studies in Marshall McLuhan’s “Body Extension” (McLuhan, 1964), the contemporary philosophical thought of “Body Without Organs” (Gilles Deleuze and Félix Guattari, 1983), the computational Logic of ‘Swarm Behavior’ and the philosophical notion of “Monadology” proposed by Gottfried Leibniz (Leibniz, 1714). Embodied computation and design are predominant today within the wearable computing and smart living domains, which combine Virtual and Real worlds. Technical progress and prowess in VR development also contribute to advancing 3D smart architectural design and display solutions. The proposed ‘Organic body-like architectural spaces’ emphasize upon the realization of a body-like interactive space. Developing Interactive Architecture will imply eliciting the collective intelligence prevalent in nature and the virtual world of Big Data. Interactive Architecture shall thus embody integrated Information exchange protocols and decision-making systems in order to possess organic body-like qualities. The “HyperCell” research, through an elaborate investigation on the three aforementioned topics, develops a design framework for developing real-time adaptive spatial systems. HyperCell does this, by developing a system of transformable cubic elements which can self-organize, adapt and interact in real-time. These Hypercells shall comprise an organic space which can adjust itself in relation to our human bodies. The furniture system is literally reified and embodied to develop an intra-active space that proactively provokes human movement. The space thus acquires an emotive dimension and can become your pet, partner, or even friend, and might also involve multiple usabilities of the same space. The research and its progression were also had actively connected with a 5-year collaborative European Culture project: “MetaBody”. The research thus involves exploration of Interactive Architecture from the following perspectives: architectural design, digital architectural history trajectory, computational technology, philosophical discourse related to the embodiment, media and digital culture, current VR and body-related technology, and Evolutionary Developmental Biology. 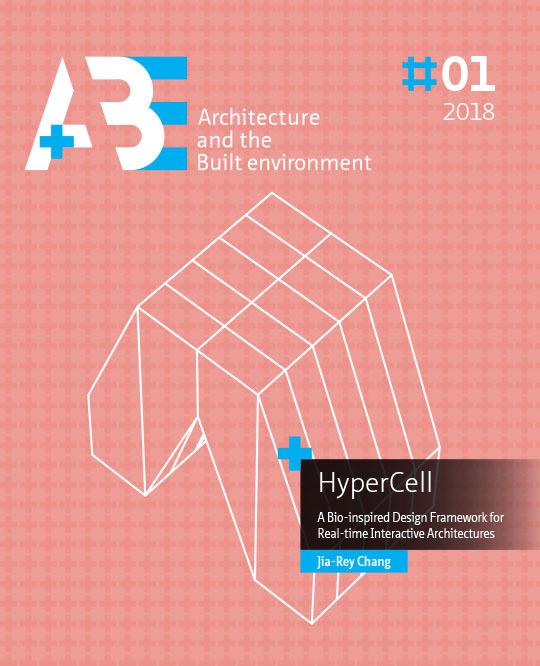 “HyperCell” will encourage young architects to pursue interdisciplinary design initiatives via the fusion of computational design, embodiment, and biology for developing bio-inspired organic architectures. This research examines three fundamental topics: Computation, Embodiment, and Biology to develop a design framework for developing Organic, Interactive Architectures. The design framework is termed “HyperCell”, which involves, developing real-time interactive designs leading to novel organic architectural proposals. Furthermore, such a biotic space advances the next level of artistic and philosophical discourse via broadening the range of innovative interactive architectural design thinking. The ultimate goal of the research is to evoke and enrich more innovative interactive architectural design to take place in the near future. The 60s was the age of freedom and boldness. According to John Lennon, the legendary singer-songwriter, who said in his last interview for RKO, “The thing the sixties did was to show us the possibilities and the responsibility that we all had. It wasn’t the answer. It just gave us a glimpse of the possibility”.10 Various technologies and cultures were developing boundlessly at an unprecedented speed during this time. Movements for civil rights due to racial discrimination, movements for women’s rights due to feminism, liberation movements for bodily autonomy, and student movements (Mai 68) in France due to the education system, influenced and challenged the conservative thought and systems in the society which people were used to. With the flourishing development of high-end technology, during the cold war period, the US and Russia were still competing to be the world leaders in technological development. The battlefields of the well-known space race included not only the terrain of the earth but also the surface of the moon. For the general public, the impact of rapid technological development, plus the discovery of chaos theory in Science and the gradual advancement of computer technology, opened the door towards all kinds of imagination about how the future world will look. The influential pop art movement, gave new birth to art which was no longer bigwigs’ assets hung on the walls of a royal palace and high-end art galleries, but relatively closer to people’s daily lives by using common substances and materials for creating art pieces. In addition, with the growth of the underground hippy culture and rock ‘n roll music, it was the golden age when people gradually had the courage to explore, to experiment, to express personal opinions, and dare to imagine and expect a future life of their own. And this was also the time when Archigram was born. How computational technology start to take place and gradually become being heavily involved/implemented in the design process of architectural design. In the architecture domain, not only the proportion of the assistance from computational techniques has been increasing exponentially, but also, the role they play has been gradually shifting from a supporting one to a generative one. No longer limited to being a complex mathematics calculator, computers, have become a ubiquitous necessity in our daily life and even influence the way we live. This, is especially true for the young generation who were born in this digital world, mainly referred to as the “Generation Z”. Business Insider, a fast-growing business media website, mentioned that “Gen Z-ers are digitally over-connected. They multitask across at least five screens daily and spend 41% of their time outside of school with computers or mobile devices, compared to 22% 10 years ago, according to theSparks & Honey report.” When Alan Turing first invented the room-sized “Turing Machine” to decipher Nazi codes, he couldn’t have expected that this giant machine could one day be put into one’s pocket and efficiently compute a million times more data. As compared to the era of tools, such as paper and pen, the computer, in today’s context has been heavily utilized and relied upon as a powerful instrument. This change is remarkable, considering the relatively short period of time, especially after 1981 when the first IBM personal computer was released (Mitchell, 1990). Architecture Design cannot be excluded from this inevitable technological tendency. Even the most conservative architecture firms are now required to deliver digital technical drawings to communicate amongst designers, clients, and construction firms in the present scenario. Incorporating computer technology in today’s context also provides young designers the opportunity to experiment with creating relatively complex geometry based architectural space. But before applying this powerful technology in architectural design, the crucial knowledge behind it that architects had to understand and realize was the manner and procedure of “Processing of Information”. Without information, the computer would be just lying on one’s desk as a useless cube, like a vehicle without a driver, or a body without a soul. The shifting roles of computer technology in architectural design are obviously defined by the manner of how designers interpret, digest and operate/process the streams of information flow. In the present digital age, the body tends to extend beyond it being flesh, it can be extended, it is a body without organs, and it might belong to more than your own-self. The “Body” as a living entity with its embedded sensory system, not only embodies who we are but also lets us understand and explore the sensitive, unpredictable but fascinating world. The body is an information receiver as well as information reactor. Through years of medical experiments and research on the body, medical devices and instruments are able to allow us to look into the deepest and the most mysterious spots in the human body. For instance, if seen through an HD monitor, while being probed by an endoscope, the body appears as an immersive and infinite landscape. By observing the smoothness and the folds of the surfaces encountered within the body, it is quite simple to project your individual self into this body-scape for a while to imagine and experience this immersive organic space. Various potential ideas of designing a body-like space have become the subject of design fantasies of a number of architects. The “Vitruvian Man”, which, Vitruvius described in the third book of De Architectura, and was later interpreted and illustrated by Leonardo DaVinci, has served as the human figure/body representation to be used as a measuring unit rather than being considered as a sensitive object. Unsurprisingly, it was a relatively long journey for architects to abandon this dogma. After the industrial revolution (during the modernist era), the concrete evidence of considering body proportions as potential measurements could still be seen in the projects of Le Corbusier, which accompanied his famous school of thought: “A house is a machine for living”. He developed the “Modular” in a mathematical proportion of space based on figures and intended to replace the old Vitruvian man with it as a new generation’s typical model. However, with the rapid development of electronic technology, the trend of realizing sensory environments akin to living bodies has no longer remained a thought but can be seen as an initial action to refuse to see the human body merely as a measuring unit. The turning point came about the time while the medium of news media, television, and social media became relatively mature, and thus started making people conduct critical reflections. Marshall McLuhan, a well-known pioneering media theorist, stated in his well-known publication, “Understanding Media: The Extension of Man” (McLuhan, Understanding Media: The Extensions of Man, 1964). This explicit shot made the researcher foresee the potential and intimate relationships between the body, technology, and space, and somehow have a rational explanation to extend the physical body to endless space, which is crucial in this chapter. Starting an overall investigation by categorizing current bio-inspired architectural design developments into “Material”, “Morphological”, and “Behavioral” to explore a novel definition of the “New Generation Organic Architecture”. It takes less material to do the same job better. The complexity of built things now reaches biological complexity. Nature will not move, so it must be accommodated. The natural world itself—genes and life forms—can be engineered (and patented) just like industrial systems. All the crucial points described above can be easily observed in the architectural industry as well. Each statement corresponds with material optimization, multidisciplinary technologies, evolutionary processes, and genetic engineering which are all involved in current digital architectural design developments. After years of evolution, the developments of “Organic Architecture” have been now separated into various research focuses which are distant from the original idea coined by the well-known American architect, Frank Lloyd Wright. A group of followers still insist on maintaining Wright’s original idea to develop buildings which are green and sustainable, they fit or even blend into the surrounding environment as a whole. But since the power of personal computers and sophisticated modeling software has become relatively easy to access and is employed in all aspects of architectural design, various experiments have been conducted in the last decade, which try to outline a number of new definitions pertaining to “what are the essential ideas/principles of ‘Organic Architecture’?”. Nature has undoubtedly always been the greatest inspiration for the manmade industry, technology, and architecture. This development has only escalated with the assistance from computational technology over the last few decades. The thesis will preview the pros and cons of current design developments under the big umbrella of digital organic/bio-inspired architecture. This discussion will be categorized into three major divisions: “Morphological”, “Material”, and “Behavioral” owing to the different focus of computational applications within each one of them. This research believes that understanding the relationship between Interactive Architecture and the principles of biology will become a mainstream research area in future architectural design. Aiming towards achieving the goal of “making architecture as organic bodies”, almost all the current digital techniques in architectural design are executed using computational simulation: digital fabrication technologies and physical computing. Based on its’ main biological inspirations, Evolutionary Development Biology (Evo-Devo), this research intends to propose a novel bio-inspired design thinking wherein architecture should become analogs to the growing process of living organisms (Figure 6.1). Instead of being born from static optimization results most of the architecture seems content at aiming for nowadays, this research is looking towards designing dynamic architectural bodies which can adapt to the constantly changing environments and are thus seeking optimization in real-time. In other words, architecture should come “alive” as a living creature in order to actively optimize itself with respect to dynamic environmental conditions and user behavior’ requirements in real-time. Following the notion of “architecture as organic bodies”, six major topics were derived from the publication of “New Wombs: Electric Bodies and Architectural Disorders” (Palumbo, 2000). These topics are aimed at initiating critical discussions between body and space, which, are used here to re-interpret six main traits of being an interactive architecture: Dis-measurement, Uprooting, Fluidity, Visceral Nature, Virtuality, and Sensitivity. These six topics merge diverse key points from aforementioned chapters including outlining the vision of active interacting architecture, the transformation of human bodies under digital culture, the profound biological inspiration from Evo-Devo and the fundamental componential notion of swarm, which leads to the ultimate notion of embodying organic body-like interactive Bio-architecture. Dis-measurement: Acknowledging the premise of “architecture (technology) as an extension of human bodies” proposed by Marshall McLuhan (McLuhan, Understanding Media: The Extensions of Man, 1964), it is, still difficult to explicitly define the boundary of a space, especially in the context of a borderless cyberspace (the Internet). Space in such a context expands more than ever before and thus makes traditional measurements techniques unfeasible. With cyberspace, people can be virtually present in different places at the same time, thus breaking existing physical boundaries of a space. From another point of view, space as an extension of our bodies constantly adapting to environmental conditions and user demands, creates an intimate linkage between physical bodies and spatial bodies. Interaction in such instances can be seen from a micro-scale: between biological cells and intelligent architectural components to the macro-scale: between physical organic bodies and spatial bodies/architectural space. Uprooting: Apart from further extending the “Dis-measurement” idea by directly plugging into cyberspace (the Internet), “Uprooting” is also interpreted as adaptation devoid of any site/location constraints. In other words, the idea of “Uprooting” implies, generating an architecture that can adjust/modify in accordance with its existing surroundings by interactions between its smallest intelligent components like cells in a body searching for dynamic equilibrium. In this case, architecture has no particular reason to be designed as “rooted” on sites. Fluidity: With the neural system inside the body, most of the messages can be transmitted, received and sent within less than a millionth of a second. To envision architecture as an information processor, which has abilities to react to dynamic environmental conditions and user demands, efficient information protocols must be built into such an organic architectural body to create seamless exterior/interior transformations. Visceral Nature: Visceral can be interpreted in the form of an embodied organ. This implies envisioning architecture in the form of a living-entity. It is no longer the case of mimicking a natural form and thus claiming a building to be organic, but rather instigates one to look deeper into the principles of a natural form’s morphogenesis and apply these to generate a truly organic space. Through the study of Evo-Devo, several principles will be applied to generate an interactive organic Bio-architecture. It is thus not an organic looking shape that matters, but the principles behind the shape, which matter. For instance, principles of self-organization, self-assembly, and self-adaptation, providing possibilities of making body-like architectures with multi-directional and multi-modal communications both inside out and outside in. An intelligent architecture, should “live” in the environment just as how the body lives with its’ Visceral Nature. Virtuality: It is impossible to talk about physical space without mentioning virtual space nowadays. From cyberspace, augmented reality to virtual reality, “Virtuality” is related to “interaction” since the beginning and has gradually become an inevitable aspect of our daily lives. In fact, virtual space has to still use constraints from the physical world to enhance experiential aspects. The ultimate goal of virtual reality here is not to end up with a VR helmet and keep constantly being stimulated by electronic messages, but to bring the physical to the virtual and in the process, attempt to search for a dynamic balance between the virtual and real by merging them together. With the assistance of virtual reality, novel unrealistic space can still be realized into creative tangible immersive and fascinating spaces, which, earlier was not possible. Sensitivity: The notion of “architecture is an extension of human bodies”, is crucial to embrace, if we consider enhancing the sensing abilities of the space as a body not only externally but also internally. In a digital space, active sensing can be achieved by attaching specific devices. In an interactive space, like an organic body, the sensing capabilities of the space have to be fast, accurate, intuitive, and predictive. The sensing system should thus not only work externally to sense the surrounding environment but also internally in order to fulfill the users’ demands in time. With such a connection between human bodies and spatial bodies, it should become relatively understandable for the space to know the requirements of the users by means of hand gestures instead of verbal cues. The sensitivity, in this case, should rely on local information distribution as a bottom-up system rather than a top-down centralized demanding structure. Interactive Architecture should embody the features of “Information”, “Improvisation”, and “Integration” in order to generate sufficient “Intelligence” to embody the authentic kernel of “Organic Architecture”. In the domain of Interactive Architecture, it is quite easy to become trapped in discussions predominantly focused on technical discourses. This is what can be observed in most of the published materials on Interactive Architecture available in the market today. These publications draw too much attentions in the manner of how to make technical systems, instead of focusing on why to make it. Partly, this may be because it is necessary to understand hands-on technical issues, however, there should certainly be more informative material to fertilize design thinking of Interactive Bio-Architecture. Some other publications in the same genre fall into a collection of on-going case studies in the domain of Interactive Architecture without properly arranging them into an organized systemic discourse. Unlike such publications, this research attempts to become a pioneering exploration attempting to address Interactive architecture as the convergence of three areas: Computation, Embodiment (Body), and Biology. From the computational point of view, the research outlined the historic trajectory of computational applications in digital architecture design or CAAD (computer aided architectural design) and its evolution from data storage, rendering representation, towards sophisticated physical computing. From embodiment(body) perspective, a wide range of issues from diverse fields of metrology, philosophy, media studies, interactive art, VR and motion tracking technology have been elaborated upon in order to discover intimate relationships and connections between (cyber)space and (cyborgs)human. In the section of Biology, the discussion ranged from the so-called organic architecture design that remains at the stage of mimicking organic shapes, to extracting and translating the fundamental premises of morphogenesis from Evolutionary-Development Biology (Evo-Devo) in order to propose computationally assisted body-like interactive Bio-architectures. By leading the arguments slightly more towards the humanities, cultural, and social or even biological aspects, it aims to broaden the research scope of Interactive Bio-Architecture to reverse its stereotypical associations of being extremely technical and engineering oriented. This research thus concludes by providing critical emphasis on topics such as Information, Improvisation, Integration, and Intelligence, which are reflective of the fundamental essence of the inter-disciplinary research elaborated in each chapter of the thesis.